Twin bombings during a church service in the southern Philippines killed at least 18 people and wounded 81, days after a referendum on autonomy for the mainly Muslim region returned an overwhelming "yes" vote. The so-called Islamic State group has claimed responsibility for the attack, according to the SITE Intelligence Group which monitors jihadist activities. IS issued a formal announcement claiming two suicide bombers had detonated explosive belts inside the church and its car park on Jolo - a stronghold of Islamist militants in the Catholic-majority nation. The first explosion went off inside the cathedral on Jolo, on the island province of Sulu, and was followed by a second blast in the car park outside, killing military and civilians, officials said. It followed Friday's announcement that the region, a mainly Muslim part of the predominantly Catholic Philippines, had approved a plan to govern itself by 2022, boosting hopes for peace in one of Asia's poorest and most conflict-torn regions. Monday's referendum saw 85% of voters back the creation of an autonomous area called Bangsamoro. Although Sulu was among only a few areas that rejected autonomy, it will still be part of the new entity. Defence Secretary Delfin Lorenzana called the attack a "dastardly act" and urged the local population to be vigilant and work with the authorities to "deny terrorism any victory". "We will use the full force of the law to bring to justice the perpetrators behind this incident," he said in a statement. Most of those who died were civilians, with several soldiers also killed. "They want to disturb the peace and order, they want to show force and sow chaos," National police chief Oscar Albayalde said on radio. 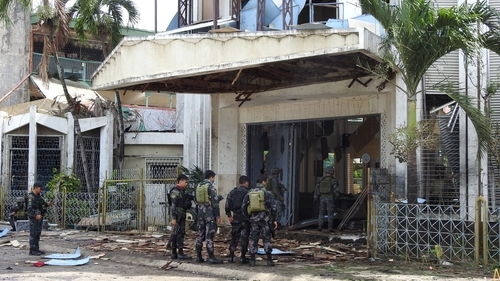 Jolo is a stronghold of the the militant Abu Sayyaf group, which has a reputation for bombings and brutality, and for having pledged allegiance to Islamic State. The militant group is also heavily involved in piracy and kidnapping. Last week's referendum came at a critical time for the Philippines, which hopes to end decades of separatist conflict in Mindanao that experts say has given rise to extremism. That has stoked fears that foreign radicals will gravitate to Mindanao to capitalise on porous borders, jungles and mountains, and an abundance of arms.